2019 AWA (American Women Artists) Spring Online Juried Exhibition. 2019 LOOKING WEST: An Exhibition Highlighting Works By American Women Artists (AWA); Steamboat Art Museum; Steamboat, Colorado. 2018 Fifth Invitational New Mexico Painters Exhibition; Kennedy Alumni Hall, New Mexico Highlands University; Las Vegas, New Mexico, followed by exhibition in Santa Fe, New Mexico. 2018 33rd Texas & Neighbors Regional Art Exhibition, Irving Art Association; Irving, Texas. 2017 Fourth Invitational New Mexico Painters Exhibition; Kennedy Alumni Hall, New Mexico Highlands University; Las Vegas, New Mexico. 2017 REFLECTIONS OF THE WEST Invitational exhibition; Kennedy Alumni Hall, New Mexico Highlands University; curated by Western sculptor Duke Sundt. 2017 OUTRAGEOUS ART group show, Mayeur Projects Gallery; Las Vegas, New Mexico. 2016 The Taos Art Museum 2016 Gala Silent Auction; Taos, New Mexico. 2016 Third Invitational New Mexico Painters Exhibition; Kennedy Alumni Hall, New Mexico Highlands University; Las Vegas, New Mexico. 2015 Second Invitational New Mexico Painters Exhibition; Kennedy Alumni Hall, New Mexico Highlands University; Las Vegas, New Mexico. 2015 Iron Tribe Conference Exhibition; Burris Hall, New Mexico Highlands University; Las Vegas, New Mexico. 2014 The Taos Art Museum 2014 Gala Silent Auction; Taos, New Mexico. 2014 First Invitational New Mexico Painters Exhibition; Kennedy Alumni Hall, New Mexico Highlands University; Las Vegas, New Mexico. 2010-2014 The Northern New Mexico Devotional Art Exhibitions; Ray Drew Gallery, New Mexico Highlands University; Las Vegas, New Mexico. 2013 THE ART OF OBSERVATION solo exhibit; Burris Hall, New Mexico Highlands University; Las Vegas, New Mexico. 2013 Raton Arts & Humanities Council 'Women Artists of New Mexico' Group Exhibit; Raton, New Mexico. 2012 'Hats & Boots' scholarship fund art auction, President's Gala, New Mexico Highlands University; Las Vegas, New Mexico. 2009 19th Annual International Faces of Woman Juried Exhibition; Las Vegas Arts Council; Las Vegas, New Mexico. 1990 Annual Women's Works group juried exhibition, McHenry County College; Crystal Lake, Illinois. 1987 'Is There Life Outside Rockford?' juried group exhibition, Gallery Ten; Rockford, Illinois. 1987 1st Annual Gallery Ten Regional Juried Exhibition, Gallery Ten; Rockford, Illinois. 1985 61st Rockford and Vicinity Juried Exhibition, Rockford Art Museum; Rockford, Illinois; juried by Thomas H. Garver, Director of the Madison Art Center; Madison, Wisconsin. 1985 2 person exhibition at the Woodstock Opera House; Woodstock, Illinois. 2013 Fiestas de Las Vegas Poster Award; City of Las Vegas, New Mexico. 2010 Fiestas de Las Vegas Poster Award; Las Vegas Fiesta Council; Las Vegas, New Mexico. 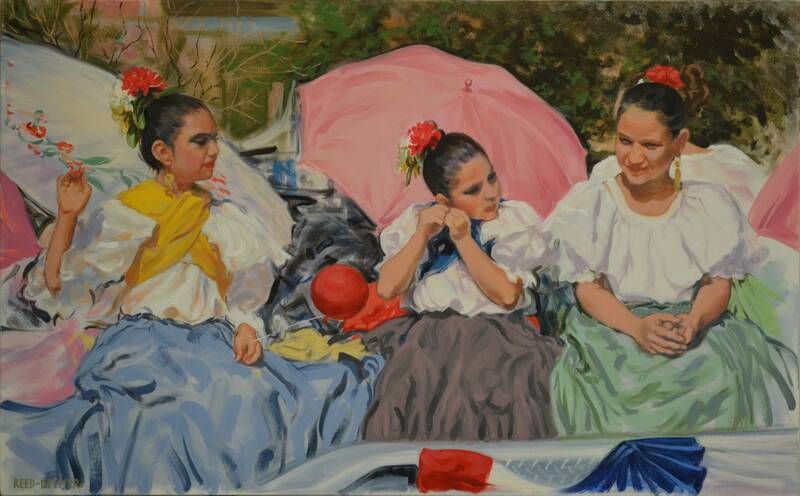 2009 1st Place, drawing division, Fine Arts Gallery, New Mexico State Fair; Albuquerque, New Mexico. 1987 Purchase Award, 12th Annual Woodstock Art Fair; Woodstock, Illinois. 1984 Award of Excellence, 9th Annual Woodstock Art Fair; Woodstock, Illinois. 2017 ‘Duke Sundt at New Mexico Highlands University,’ Michael Abatemarco; Pasatiempo, Santa Fe New Mexican; August 4, 2017. 2015 http://www.nmhu.edu/new-mexico-painters-exhibition-continues-through-october-15/, NMHU Hot News; Sept. 11. 2015 ‘New Mexico Painters Exhibition displays contemporary art created in-state,’ ABQJournal News Staff; August 30, 2015. 2015 'Iron art exhibit at Highlands University,' ABQJournal News Staff; March 1, 2015. 2009 (September 21) Northern New Mexico Arts Connection, KFUN radio; Las Vegas, New Mexico. 2015 Oil painting 'Wind' published in the Second New Mexico Painters Invitational Exhibition catalog, New Mexico Highlands University; Las Vegas, New Mexico. 2013 Informed Collector Newsletter, Fine Art Views. 2004 Illustrations for primate paleontologist Daniel L. Gebo's professional publications. 2002 The Primate Fossil Record, edited by Walter C. Hartwig, Cambridge University Press; scientific illustrations for Chapter 4 Adapiformes: Phylogeny and adaptation, by Daniel L. Gebo, pp 21-43. 2000 Newsweek, Science and Technology; illustration for 'Fossils: A Very Tiny Ancestor,' (March 27, 2000:66). 2000 Popular Science, Science and Technology; illustration for 'A Missing Link?' (June 2000:26). 2000 New York Times front page illustration of tiniest fossil primate discovery. 2000 Chicago Sun-Times front page illustration of tiniest fossil primate discovery. 2000 Reed-Deemer's Illustration of tiniest fossil primate discovery appeared on CBS News evening report. 2000 Microsoft Encarta illustration of tiniest fossil primate discovery. 1996-2004 Numerous scientific illustrations in scholarly journals. 1987 Charcoal and pastel drawing 'Lisa' published in exhibition catalog for the 1st Annual Gallery Ten Regional Juried Exhibition at Gallery Ten; Rockford, Illinois. Journal of Human Evolution (vol. 45:2:196); In the scholarly review of 'The Primate Fossil Record,' paleoanthropologist Callum Ross writes: "Gebo treats us to a detailed assessment of adapiform taxonomy and paleobiology, including some nice new illustrations by Reed-Deemer." 1996-2004 Scientific illustration, Northern Illinois University; DeKalb, Illinois. 1992-2000 Scientific illustration, Biology Department, McHenry County College; Crystal Lake, Illinois. 2019 Associate member Women Artists of the West (WAOW). 2018 Associate member American Women Artists (AWA). 2018 January: Boldbrush Painting Competition FAV 15% ('The Strike: Colorado Gold Miner'). 2017 September: Boldbrush Painting Competition FAV 15% ('The Boy With A Blue Helmet'). 2017 July: Boldbrush Painting Competition FINALIST ('Eagle Stance'). 2013 December: Boldbrush Painting Competition FAV 15% ('The Boy With A Blue Helmet'). 2013 September: Boldbrush Painting Competition FAV 15% ('Iron Tribe: Night Pour'). 2013 July: Boldbrush Painting Competition FAV 15% ('Iron Ladies'). 2013 June: Boldbrush Painting Competition FAV 15% ('Break Time'). 2013 March: Boldbrush Painting Competition FAV 15% ('The Iron Sculptor'). 2013 February: Boldbrush Painting Competition FAV 15% ('Iron Tribe: Feeding Dante'). 2011 March: Boldbrush Painting Competition FAV 15% ('Lighthouse at Dunkirk, N.Y.'). 2001 Inducted as member of Sigma Xi Scientific Research Society. 1997 Awarded Scholar in Anthropology, Northern Illinois University; DeKalb, Illinois. 2002 M.A. in anthropology (physical anthropology), Northern Illinois University; DeKalb, Illinois. 1997 B.S. in anthropology, Northern Illinois University; DeKalb, Illinois. 1991 A.S., McHenry County College; Crystal Lake, Illinois. 1979-1980 Attended the American Academy of Art; Chicago, Illinois.